Illuminadi are a symphonic metal band from Poland who mix equal parts brutal guitars and sweeping violins. Illuminadi mix classic heavy metal with doom, death, violins, cellos and some female vocals. The overall sound is heavy but also very haunting. Of the three demo tracks included here, "...wiec My..." is probably the most compelling mix of the above elements. 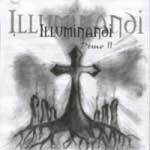 Lyrically, Illuminadi are pursuing an evangelistic, Christian approach. If the band continues to write music like this and improves upon things like production and packaging, I cannot see anything stopping them from spreading their metallic message abroad. I was slightly put off by the Polish lyrics, which sound foreign to my American ears. However, it really isn't as big a deal as I originally thought. Overall, a good demo from a promising new band.